I would like to replace the image with an icon from Font Awesome. I do not see anyway to use the icon in CSS as a background image. Is this possible to do assuming the Font Awesome stylesheets/fonts are loaded before my CSS? You can't use text as a background image, but you can use the :before or :after pseudo classes to place a text character where you want it, without having to add all kinds of messy extra mark-up. Be sure to set position:relative on your actual text wrapper for the positioning to work. For FontAwesome v5, Free Version, use: font-family: "Font Awesome 5 Free"
For FontAwesome v5, Pro Version, use: font-family: "Font Awesome 5 Pro"
Note that you should set the same font-weight property, too (seems to be 900). Another way to find the font name is to right click on a sample font awesome icon on your page and get the font name (same way the utf-8 icon code can be found, but note that you can find it out on :before). Further to the answer from Diodeus above, you need the font-family: FontAwesome rule (assuming you have the @font-face rule for FontAwesome declared already in your CSS). Then it is a matter of knowing which CSS content value corresponds to which icon. Actually even font-awesome CSS has a similar strategy for setting their icon styles. 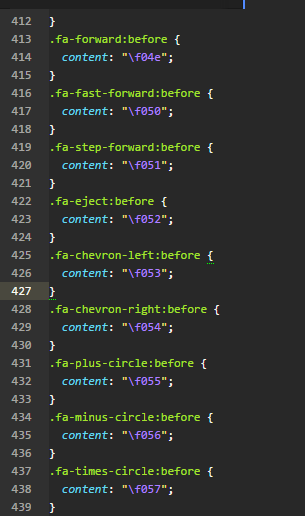 If you want to get a quick hold of the icon code, check the non-minified font-awesome.css file and there they are....each font in its purity. // between the icon and the text. And finally, use "sorting_asc" class to apply the css on desired HTML tag/element. For this you just need to add content attribute and font-family attribute to the required element via :before or :after wherever applicable. Font Awesome 5, why css content is not showing? Using relative URL in CSS file, what location is it relative to? Can I change the color of Font Awesome's icon color?